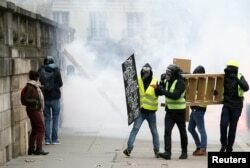 Thousands of protesters in Paris marched noisily but mostly peacefully through the Grands Boulevards shopping area in northern Paris, close to where a massive gas explosion in a bakery killed two firefighters and a Spanish tourist and injured nearly 50 people earlier in the day. But small groups of demonstrators broke away from the designated route and threw bottles and other projectiles at the police. Around the 19th-century Arc de Triomphe at the top of the Champs-Elysees, riot police fired water cannon and tear gas at militant protesters after being pelted with stones and paint, witnesses said. Groups of protesters also gathered on and around the Champs-lysees, the scene of disturbances in recent weeks, many of them calling loudly for Macron to resign. The Interior Ministry estimated that there were a maximum of about 84,000 demonstrators nationwide on Saturday — more than the 50,000 counted last week but well below the record 282,000 estimated on Nov. 17, the first day of the protests. In Paris, the ministry counted 8,000 demonstrators, more than in the past two weekends, when authorities tallied just 3,500 people on Jan. 5 and only 800 on Dec. 29. Much of central Paris was in lockdown on the first week of post-Christmas sales, with bridges across the Seine River closed and official buildings such as parliament and the Elysee presidential palace protected by police barriers. In Paris, 156 “gilets jaunes” (yellow vest) protesters were arrested, some for carrying objects that could be used as weapons, police said. As of 2000 GMT, 108 remained in custody. Nationwide, 244 people had been arrested, of which 201 remained in custody. By nightfall, there had been no looting or burning of cars as seen in previous weeks and traffic circulation had resumed around the Arc de Triomple area. Protesters participate in a demonstration of the yellow vest movement in Nantes, France, Jan. 12, 2019. Bourges authorities said nearly 5,000 yellow vests stuck to the designated demonstration area. The historical city center was off-limits for demonstrators, but 500 protesters made their way to the center, where they scuffled with police and set garbage bins on fire. Many businesses in Bourges had boarded themselves up to avoid damage, and authorities had removed street furniture and building site materials that could be used for barricades. The yellow vests take their name from the high-visibility jackets they wear. Their rage stems from a squeeze on household incomes and a belief that Macron, a former investment banker seen as close to big business, is indifferent to their hardships. The debate, to be held on the internet and in town halls, will focus on four themes: taxes, green energy, institutional reform and citizenship. But aides to Macron have said changing the course of Macron’s reforms aimed at liberalizing the economy will be off-limits.